Joey D checking in from Palm Beach. I get half the week off before heading to the Masters a few days early, so I wanted to take the time today to chat a little bit about Bay Hill. First up I want to talk about Jason Gore. Before Bay Hill, the last time most folks saw J on TV he was doubled over at Torrey Pines in some serious pain. This week he was your day one leader at -5 and he wrapped up the week T8th after receiving a sponsors exemption from Mr. Arnold Palmer himself. The back pain you saw in San Diego was the result of a golf swing in transition. It takes time for the muscles to understand the signal the nerves are sending. I know most folks think since these guys are pros, change should come easy. It doesn't. Whether you're a pro or amateur, when you're set in your ways with your movement pattern, it's difficult to break. It took many hours on the range with his coach Mike Abbott and time in the fitness trailer for Gore to complete that transition. After his struggles at Torrey, J missed the cut at Pebble, finished 74th in LA and had to withdraw in Cancun when the rib head gave him problems, he turned it around. After almost two weeks of active rest, getting biomechanically sound working on the rage, a T44th confidence-builder in Puerto Rico, which led to T8th at Bay Hill. Going into last week, we knew that Jason's body was still going through change. In an effort to bring him along at a comfortable pace, we introduced a lot of light band work and focused on movement patterns. Through the use of PowerBandz we took the neuroreceptor and got it to fire again, sending a signal to the muscle and creating movement patterns that kept him on plane and kept his club where Mr. A wanted him in the top of his backswing. Light to Medium-resistance PowerBandz allowed us to cement Jason's movement patterns inside the fitness trailer, which allowed him to do the same on the range and during the tournament. JG is definitely on track and he's a guy to keep an eye on as the year goes on. People have a short memory these days, but we're talking about a Tour winner here. Keeping your card is a challenge enough, but knowing how to win and having done so is everything out here. Also in the field last week, Ryuji Imada, who showed unbelievable poise this past week and put himself in some great positions all week long. Again, not the longest guy on Tour, but a smart player who dialed in his short game and fixed his putting this past week. A few unfortunate bogeys cost him on Sunday with that stacked leaderboard. T3rd became T17th by the end of the day, but it was another solid outing. In the trailer we had Ryuji focusing on band work as well, in an effort to open up his rotator cuff, move to the top of the backswing and using some of the similar principles we used for Gore, even though their body types couldn't be more different. 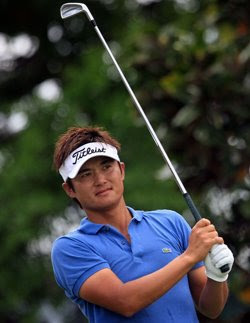 Ryuji sharpened his skills this last week and is that much more ready for the Masters. He's headed to Augusta early this week to get some extra practice in and to get his mind right for next week. 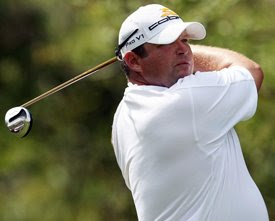 Speaking of which, this blog is another two-parter as I want to delve into some things a bit further, most notably the T4th finish of my horse Pat Perez and the difference between 'competitive fire' and being labeled a 'hot head'. What you saw in those final few groups on Sunday were some of the best in the world fighting to win a golf tournament. Whether it was Perez flinging his ball into the water on 18 or Tiger Woods slamming a club in disgust, it all comes from a passionate place and has everything to do with wanting to win at the highest level. More on that next time. Check back in Tuesday or Wednesday as I'll wrap up this week's blog before Augusta. - Joey D.